The odor of bad breath is caused by bacteria that live on the tongue and under the gums. These bacteria digest a variety of “foods” that normally occur in the mouth and then excrete sulfur compounds, the direct odor of bad breath. These bacteria live in a coating called a biofilm (biological film) that mechanically attaches itself to our tongue and under our gums. In addition, it is important to note that these bacteria do not need air to live. Thus, the millions of bacteria within these biofilms can continue to do damage even when the top layers are treated such as with mouthwash or tongue scraping. Our work on bad breath at the National Breath Center has essentially identified 3 different areas that bad breath comes from: the tongue biofilm, biofilm under the gums, and spaces and/or food traps between the teeth. Why don’t mouthwashes, tongue scraping or other remedies eliminate the odor? The biofilm that contains the bacteria is attached tenaciously to the tongue and under the gums. Home remedies such as tongue scraping or using mouthwash, even professional strength, can only affect the top few layers of biofilm. So while home remedies may work for awhile, the odor of bad breath will always come through. Why have a professional cure rather than use available products to treat my bad breath? If you have had bad breath for a while or products do not seem to work much anymore, then chances are the only treatment that will work is professional care. Because the root cause of the problem is the bacteria deep in the biofilm that is embedded in the top of the tongue and sometimes under the gums, it can no longer be covered up. Even products that kill bacteria and neutralize odor can only do so for the top layer of the biofilm. If you have had bad breath for some time this biofilm can only be removed by professional, mechanical means. Why choose National Breath Center for a bad breath cure? First, Dr. Richard Miller has been curing bad breath since 1993. At that time he developed a cure rather than an ongoing treatment that is now called the Total Cure. Second, in over 25 years, Dr. Miller has changed the lives of over 7,000 people from the United States and from 27 countries by curing their bad breath.Third, Dr. Miller and the National Breath Center guarantee that you will have no bad breath when treatment is complete. Unlike mouthwashes, gums, mints, and other products that are only temporary fixes, the Total Cure is the opportunity to take control of your life again. We are the only facility in the world that makes this guarantee. Can I hear from actual patients that have been cured? You may wish to review the photos that show the tongue biofilm before and after treatment . Due to federal law we cannot show actual patients without their consent. However, you may also be interested in the audio stories available on our web site, told by actual patients as to how the Total Cure has changed their lives. Why is this being done only at the National Breath Center? Dr. Richard Miller has devoted the last 25 years of his professional life to curing people of bad breath and changing lives. He is the #1 clinical expert on bad breath. Other dentists involved with bad breath have chosen to sell products as a “cure” even though these only work to a limited degree. It takes much less work and commitment on a dentist’s part to do this. Do you perform the Total Cure on smokers? There is no way to cure a smoker of bad breath. The National Breath Center will only accept a former smoker as a patient if they have not smoked for at least 6 months. Only then, will the Total Cure be effective. What exactly is the bad breath Total Cure? The bad breath Total Cure is a hands-on bad breath elimination treatment performed at the National Breath Center by halitosis expert, Dr. Richard Miller and his team. The Total Cure removes bad breath at its source. This is not a product-based “cover-up” treatment. It is a bad breath elimination solution that can be maintained for life. How does the National Breath Center’s Total Cure differ from other bad breath clinic treatments? 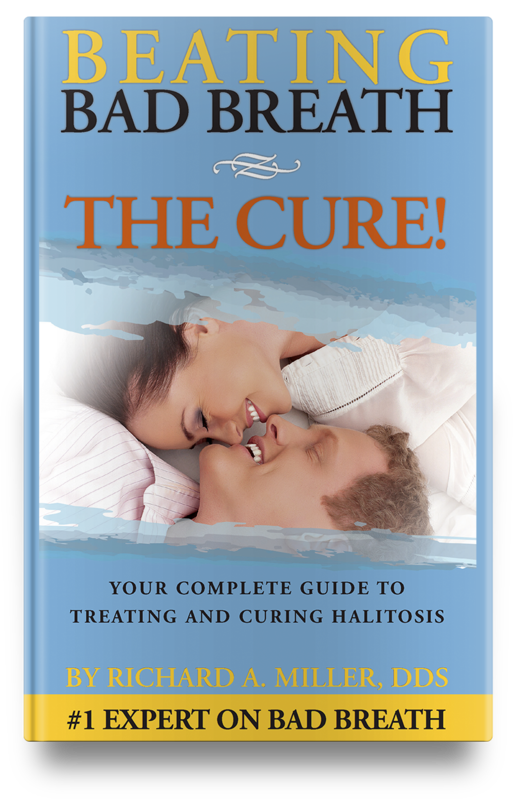 Here is the definition of a cure: A cure should eliminate the problem itself, all related causes, and provide the means to keep halitosis from coming back. Instead of covering up the problem with a pleasant odor, or only removing the top layers of bacteria and odor (like many internet cures), our technique totally removes the problem at its source — the biofilm and gives you the tools and techniques to keep it from coming back. 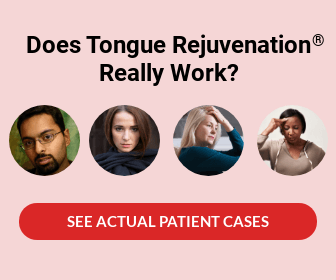 What exactly is tongue rejuvenation? Tongue Rejuvenation is one of the actual procedures that is part of the Total Cure. It is a proprietary technique (patent pending) that gently but meticulously removes the biofilm from the tongue. Once the biofilm is completely removed, the odor is gone. Are there any risks with the bad breath Total Cure treatment? None at all. The Total Cure treatment has been performed over 7,000 times in 25 years with no ill effects. It is a painless procedure that does nothing to damage mouth tissue, only the biofilm that is the cause of the problem. Will the Total Cure hurt? No. Tongue Rejuvenation is a painless procedure. If the biofilm extends under the gums, local anesthetic is sometimes needed to remove it. 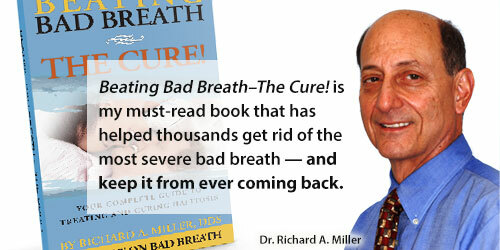 Will my bad breath Total Cure be performed by Dr. Richard Miller? Every detail of your Total Cure treatment will be personally overseen by Dr. Miller. However, the Total Cure is a team approach and Dr. Miller’s trained staff will also participate. How many treatment sessions are needed for my Total Cure? As with many medical procedures that is hard to estimate without the Comprehensive Halitosis Examination. Before we can determine this with certainty, the severity of the problem must be assessed along with the tenaciousness of the biofilm, the extent of the biofilm, the degree of odor, and many other factors including the four tests for bad breath done by Dr. Miller. However, depending on the severity, the number of sessions has historically ranged from as little as 6 sessions up to 20 sessions in the worst cases. Dr. Miller will discuss this with you during your examination. How long does the Total Cure last? For the vast majority of patients, virtually a lifetime. Just like you would between dental checkups, you will need to perform some preventive maintenance. It is quite simple to do and only adds a few minutes to your normal brushing and flossing. In some cases, regular “touch-ups” are needed to eliminate any biofilm that may be forming before it can create an odor. This will depend on the anatomy of the tongue and the propensity to develop a biofilm, all determined during treatment. They can be combined with regular check-ups for future visits if needed. Is the National Breath Center’s bad breath Total Cure guaranteed? Yes! After curing over 7,000 people in the past 25 years, we are so confident that you, too, will be cured, we are offering a money-back guarantee. If, after the Total Cure is concluded, you fail to pass all of the above four tests (tests are negative), you will receive a full refund of your treatment cost. How much does the Total Cure cost? As you might expect, only after a comprehensive examination to determine the severity of halitosis can we determine if you are a suitable candidate for the Total Cure. At that time you will be presented with a treatment program cost summary for your individual case. We invite you to talk with Karin, our Breath Counselor, as she can provide you with valuable information. In general, because we usually see many people with extreme halitosis, and because the National Breath Center is the place of last resort for chronic, severe bad breath, our patients invest anywhere between a general range of $4,000 – $9,900 (most difficult cases) to change their lives, before any available discounts. Need more information? Read about the Total Cure procedure and Costs. Insurance companies regard the condition of halitosis as a cosmetic problem, so unfortunately, insurance will not pay for treatment. However, if you do have a gum component of bad breath, your insurance company may reimburse you for that part of treatment. How does the Room Reservation Fee work at the National Breath Center? Are there any payment plans or financing available for the National Breath Center’s bad breath Total Cure? With multiple financing and payment options available, the Total Cure at the National Breath Center has never been more affordable. Many patients find financing a convenient, affordable way to get the procedure they want right now. You owe it to yourself to speak with our Breath Counselor about how to change your life with the Total Cure at the National Breath Center and leave your bad breath behind forever. How effective are high end mouthrinses at getting rid of bad breath? Products such as these can only affect the very top layers of the tongue biofilm. For some people this may be enough for a time. However, as the biofilm keeps growing, these products become less and less effective. Can natural remedies like chlorophyll, digestive aids or herbs get rid of bad breath? Digestive aids may help digest foods, however, unless one has severe G.E.R.D. (gastro-esophageal reflux disease), there are a series of valves that prevent regurgitation of food and odor back into the mouth and out the breath. It is a myth that bad breath comes from the stomach. Research has repeatedly shown that in over 90% of the cases, bad breath is an oral problem. Other remedies and herbs cannot penetrate the biofilm coating and can only affect the top layer of the biofilm. Does the National Breath Center offer next generation breath products, such as ones containing chlorine dioxide? Yes. After much testing of products available to treat bad breath, and the less than adequate results achieved, the National Breath Center designed its own line of products – the Supreme Breath products with Tru-Active Chlorine Dioxide™. It is currently the most powerful bacteria and odor killer for bad breath and we recommend it to our patients for preventive maintenance after the Total Cure. However, unlike other breath product manufacturers, we do not claim that it cures bad breath. While it will last longer and is more powerful than other products on the market, if someone has chronic bad breath, then eventually the odor will come through.